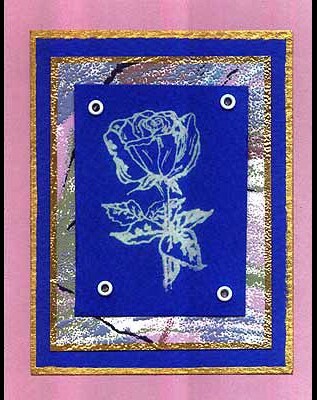 “Rose with Stem” is stamped with bleach on royal blue card stock. Eyelets are set in the edges of the piece. This piece is layered on wallpaper edged with a gold Krylon Leafing pen, then layered on a blue rectangle which has also been edged with the gold Krylon Leafing pen. This is layered on a mauve card. Card by Margaret Wiggin.